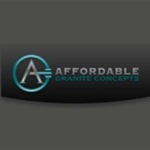 Affordable Granite Concepts boast 14 years of experience in our specific expertise and unique specialties. We always have our eyes out for new and exciting products. We frequently attend seminars to always stay updated about the latest and greatest building products for our clients.